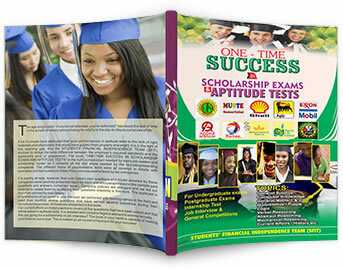 We run our scholarship programs and services under the Students' Financial Independence Team (SFIT). This body is experienced in scholarship information and notifications, scholarships best application strategies, Scholarship counseling and tips, scholarship materials and resources availability. 12 GANI FAWEHINMI 70k All AUG.
13 MUSTE 100k All NOV.
Our Past Questions and Answers collection for over 15 scholarships still remains the best among equals in the market. Companies questions featured are SHELL, MTN, Chevron, Agbami, Addax, Agip, NLNG, Total, SPDC, British Tobacco, Mobil PTDF etc. All areas of testing are covered.